Help little illusionists amaze with simple sleight and learn about magical history and trivia. Think it takes magic to turn a rainy day into a memorable adventure? It just takes this box full of magical inspiration. 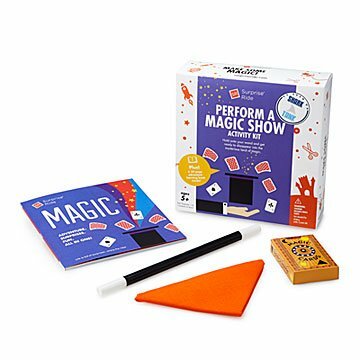 Help little illusionists amaze their audience (that's you) as they use math and some simple sleight of hand to perform their own magic show. It includes everything they need to master mysterious illusions: Perform six tricks with the deck of special cards and companion booklet; add showmanship with the secret scarf and wand; and enjoy the bonus book filled with an illustrated short story ("The Magic Rabbit"), highlights of magic history, and tricky tongue twisters to share with friends. Made by sisters Rosy and Donna Khalife in California. For ages 5+.